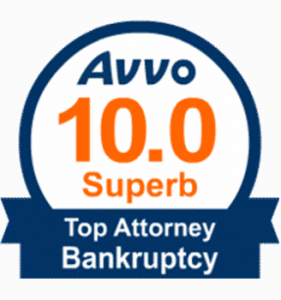 Chapter 7 bankruptcy is the most common type of bankruptcy filing. Under Chapter 7, the debtor’s assets / personal property are liquidated /sold and the proceeds are used to pay creditors. A Chapter 7 filing may result in the loss of all non-exempt property, a complete discharge of all eligible debts, and no further obligation to pay discharged debts in the future. There are certain debts that are non-dischargeable under Chapter 7, such as mortgages, liens (such as car loans), child support, alimony or debts incurred through fraud. A debtor must pass the Means Test to qualify for Chapter 7 bankruptcy. Simply put, the Means Test evaluates a debtor’s income to determine if he is in need of Chapter 7 relief. If a debtor passes the Means Test, he is permitted to file for Chapter 7 bankruptcy; if not, he may file for Chapter 13 bankruptcy. • $5,000 of personal property if you do not claim homestead. A debtor must pass the Means Test to qualify for Chapter 7 bankruptcy. The Means Test is a form that each debtor must complete to establish his income and compare it to the Florida median income for households of a similar size. If only one spouse is filing Bankruptcy the means test is based on both spouses past six months gross income times two. The month in which the case is filed is not included. For example, if a debtor files in December, the preceding months of June through November will be calculated to determine the means test. If the debtor’s income for the most recent six months preceding the bankruptcy filing is below the median income, he passes the Means Test and may be eligible for Chapter 7 bankruptcy. If the debtor chooses to keep assets that are more than those allowed in Florida they may be looking at filing a Chapter 13. If they want to strip a second lien on a homestead they must file Chapter 13. If they are in arrears on their car payment or home payment and they wish to retain the car or home they may be permitted to catch up on past due payments during a Chapter 13 plan. If you have any additional questions regarding the Means Test or filing for Chapter 7 bankruptcy in Sarasota, Bradenton, Venice, Nokomis, Englewood, Port Charlotte, Myakka City or the surrounding areas, please feel free to contact Ms. Ellis for a free consultation.